For a lot of people, their car is more than just an easy mode of transportation. People love their cars, give their cars names, and treat it like a second home. Spending more time in your car than in your home is very common for the average person today. So why don’t we take care of them a little better? While you may run your car through a car wash every now and then, that only takes care of the dirt on the outside—what about everything that’s been building up on the inside? Studies show that the average vehicle’s interior has roughly nine times as many germs as a public toilet seat, yet people rarely think about giving their car anything more than the occasional vacuum. Most people won’t go in a public restroom, much less drive their kids to school in one. We certainly wouldn’t let our homes go so long without a proper cleaning! Think of all the things you do in your car. All those snacks while on the run are sure to add up in addition to whatever is in your cup holder. Also consider the volume of people who have ridden in your car, especially any small children. What could they be carrying that is now in your vehicle? Car interiors, on average, are 55% dirtier than keyboards and a whopping 2,144% dirtier than the smartphone that follows you everywhere. 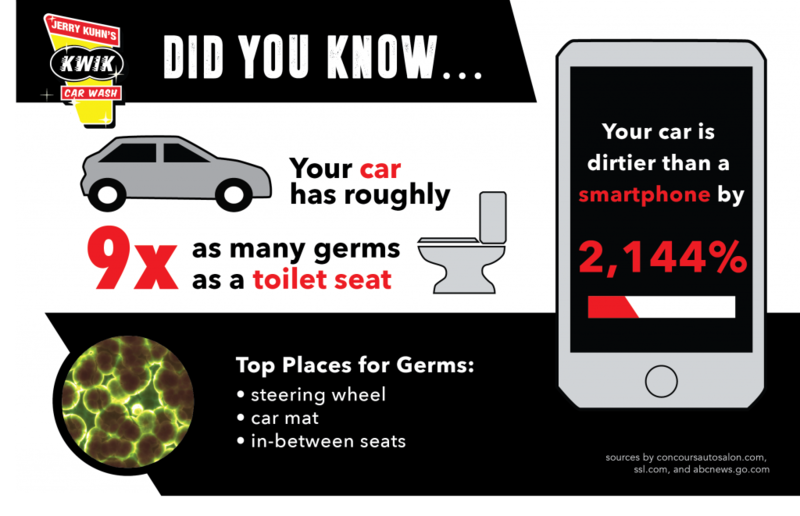 On average, a smartphone has 25,000 germs per square inch—yet your car is somehow dirtier. Think of all the illnesses we could prevent if this bacteria heaven were cleaned more often! Common places for germs to be hiding is the steering wheel, car mat, in-between seats, cup holders, and wherever loose change is kept. The most common response as to why vehicles’ interiors aren’t being cleaned as often as they should is lack of time. Vacuuming, wiping down, and totally disinfecting an entire vehicle—especially in those hard-to-reach spaces—can be a daunting task. Luckily, places like Kwik Car Wash are right around the corner to take care of it for you while you relax inside with a hot cup of coffee. With our anti-bacterial add-on, you’ll be able to enjoy a fresh and clean interior that keeps both you and your family out of bacteria’s way. Not only will you feel better driving around in a car that feels brand new inside and out, but you’ll also be taking an essential step in the right direction for your family’s health and safety. And to top it all off, we also have wipes to clean your smartphone.